Judy Macklin is a practising artist and educator with over 40 years experience, including teaching on undergraduate programmes for lifelong learning and workshops in the community. She won Tutor of the Year in 2016 at Aberystwyth University. Judy is co-director of Aberystwyth Printmakers established in 1979 and was a founding member. Her art practice encompasses a wide variety of natural and human-related subjects, including New and Old World landscapes, with a focus on art-science collaboration and community engagement based on watery themes. She has exhibited worldwide in Australia, Bulgaria, China, France, Germany, Hong Kong, The Netherlands, Korea, New Zealand, Romania, UK and USA. Her work has been supported by grants from Northern Arts, The Geoffrey Crawshay Memorial Travelling Scholarship, The University of Wales Strategic Insight Programme, West Wales Association for the Arts, The Prince of Wales Trust, The Welsh Arts Council and Wales Arts International. Among her current projects are collaborative works with members of the Print Council Aotearoa New Zealand exploring long-term society river-environment interactions, and the Australian Research Council funded "Rivers of Gold" project investigating the cultural and environmental legacy of mining in Victoria, Australia. Recent projects include "Curious Travellers" www.curioustravellers.ac.uk jointly run by the University of Wales Centre for Advanced Welsh and Celtic Studies and the University of Glasgow, to explore Romantic-period accounts of journeys into Wales and Scotland and resulted in The exhibition Curious Travellers: Movement, Landscape, Art. "Towards Hydrocitizenship" www.hydrocitizenship.com a three-year project (2014-2017) that combined practical academic research with community participation and creative activities. It asked a simple question: What does water mean to us, as communities and individuals? Judy and Mark Macklin undertook joint residencies at Borth and Tal-y-bont Primary Schools. 2013 Judy received a research and development grant from Wales Arts International for an art-science collaboration based in Brisbane to investigate the Queensland floods in a project titled "Re-thinking Mythscapes in the Watery Realm". This followed a successful Joya: arte + ecología residency in Andalucía, Spain during the summer of 2012 which cemented a transdisciplinary collaborative working partnership with Professor Mark Macklin (School of Geography, University of Lincoln). In 2011 Judy undertook a 3 month working period at Amsterdam's Grafisch Atelier in collaboration with the Department of Geography, Utrecht University which culminated in an exhibition of prints "Sacred River Landscapes: Process into Pattern". 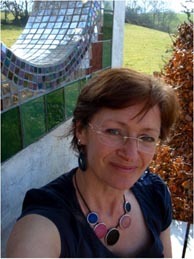 2009-2010 Judy participated in a "Art Landscape Transformation" pan-European project working in Romania. In 2007 she was invited to the internationally renowned Lithography Workshop at the Tamarind Institute, New Mexico, USA, which was funded by a Welsh Arts Council Training Grant. 2006 saw the opportunity for her to spend three months at the University of Arizona undertaking printmaking projects and winning the Geoffrey Crawshay Memorial Scholarship resulting in an exchange exhibition between Aberystwyth University and the University of Arizona "Earth and Sky; Tucson and Aberystwyth". Xiaoxiang International Centre Changsha Normal University/Hunan Fine Art Publishing House; The University of Colorado Special Collections, USA; University of North Florida Print Collection, USA; Simon Fraser University British Columbia, Canada; University of Arizona School of Art, USA; Aberystwyth University Arts and Crafts Collection, Wales; North Tyneside Council, England; Countryside Council for Wales. Macklin, J.E. and Macklin, M.G. (2011). Rivers - lines of time. In S. Mills (Ed. ), Interventions: Magura past and present. Bucuresti: Renaissance, 59-72, 2011. Macklin, J.E. and Macklin, M.G. (2013). Deep Reflections. Printmaking Today, 22(2), 31. Macklin, J.E. and Macklin, M.G. (in press). Art-geoscience encounters and entanglements in the watery realm. Journal of Maps. Judy and Mark Macklin have been sea rowing with Aberystwyth Rowing Club since 2005. Their most notable achievements were being part of the 2010 Mixed Team Champions in the bi-annual Celtic Challenge (96 mile rowing race from Arklow in Ireland to Aberystwyth, Wales) and winning the Great River Race (London's River Marathon), Celtic Long Boat, Mixed and Mixed Veterans classes in 2015 and 2017. They take part in the seasonal league races organised by the Welsh Sea Rowing Association all around the Welsh Coast ranging from Bull Bay in Anglesey to Pembroke Dock in South Wales.